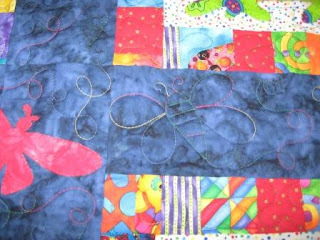 I have been quilting like mad again. 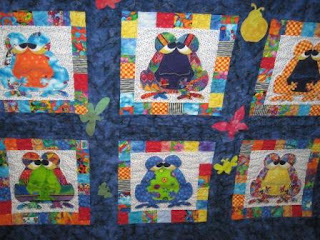 This cute as a frog quilt is going home to a customer on the other end of the country. A good friend moved out east and her new quilting friend loved the quilt I had done for her. So she mailed me a quilt. Our friend is flying back this week and will take it home to her. Postal strike still on, so glad this one is not going in the mail. I kind of knew what I want to quilt on this quilt by just a little note about it being frogs and other bugs appliquéd on the it. I knew I wanted to do more quilted bugs. The frogs are fused appliqué and then hand blanket stitched with variegation thread. This detail does not show up in the photos. 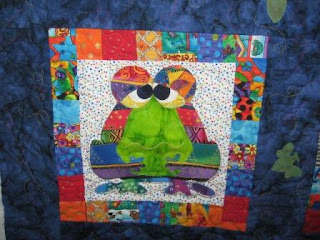 I did just a hint of quilting on the frog. I then outlined the frog and stitched in the frame. Here is one of the bugs I did. It is a bee. I also did butterflies, dragonflies, and ladybugs. This was a very fun quilt to work on and turned out so cute. Update on my quilt from the National Juried Quilt Show. I have heard from them at CQA. They did not put the quilts in the mail till they knew what was going on with the postal strike. Now they have asked me how I want my quilt sent home. Because the postal strike is rotating and the mail is still moving, just slower, I asked it be sent home by mail. So maybe Monday it started the trek home. We did not have any mail yesterday. Maybe by Friday - I am hoping. I want to take it to the Quilt Show, so I can display it at my booth. Keeping my fingers crossed.